There’s a real skill when it comes to making macarons, something I didnt quite appreciate when embarking on this baking challenge. I was feeling rather cocky, perhaps high on my last French-baking success. I decided that I didn’t want to make just regular macarons, I wanted animal macarons! I wanted bears, rabbits, unicorns and more! 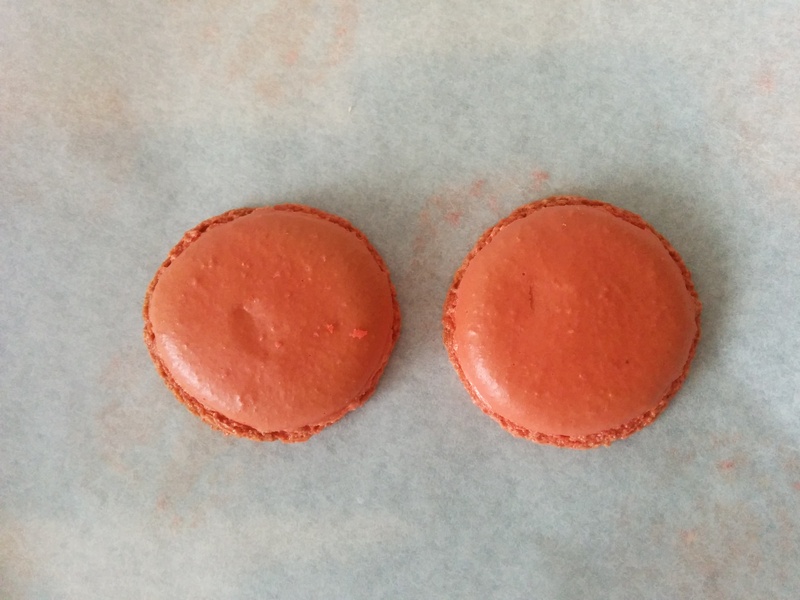 But alas, I was rather foolish, and what follows is a what not-to-do guide when making macarons. Let’s for a moment think about macarons in terms of their shells. The perfect macaron shell must satisfy two requirements: cosmetic and textural. Cosmetically, the macarons must have a spherical, domed shape, the top of which is shiny, smooth and void of cracks. The shell must also contain “feet”, a chewy base to the shell that has a rough, sandy look. Texturally, the outer macaron shell should be crunchy, while the inside should be marshmallowy and chewy. This crunchy-chewy textural dichotomy makes macarons moorish. The impossibly high cosmetic and textural standards of a macaron make them a bit of a nightmare to bake, especially when considering the simple-looking recipe. Most macarons are made by mixing almond meal, icing sugar and egg whites to form a paste. A meringue is then incorporated into the almond paste to form a batter, which is then piped and baked to form macaron shells. At a distance, this recipe seems rather fool-proof, but I assure you, that many things can go wrong! From beating to piping, creating the perfect macaron shell requires a great deal of skill. Thankfully, science is here to help us iron out the most common mistakes. Below, I identify three types of ill-formed macarons, that I call mistakarons, and simple remedies to success. When you’ve spent several hours baking, it can be disheartening to find your macarons resembling your former pubescent self: skin crackled, pimpled and blistered. But it happens. Shells can come out of the oven with cracks, a bumpy surface and most insidiously, a small alfafa-esque peak. Pubescent mistakaron. The shell is rough, cracked and has an insidious peak in the middle. This is most spinning top than macaron. The good thing is, beauty is only skin deep, and these macarons (that you’re really only interested in because of their personality) still taste crunchy and chewy. But if you do want to superficially spruce your shells, I have one word for you: macaronage. Macaronage is the term used when combining the meringue with the almond paste. If the macaronage process isn’t done quite right, it can lead to either very dense or very flat macarons. The former is the reason for your pubescent mistakarons. During the macaronage process, you need to let go of every instinct that you have as a baker. Intuition tells us that when incorporating a light and airy meringue into a gooey paste, we need to retain as much air as possible. So as bakers, we carefully fold-in the meringue, until it is just incorporated. I URGE YOU THOUGH, LET IT GO! The macaronage process actually requires you to BEAT OUT some of the air in the meringue. This will feel like the most criminal moment in your entire baking life, but trust me, it’s what the macarons want, no, NEED! 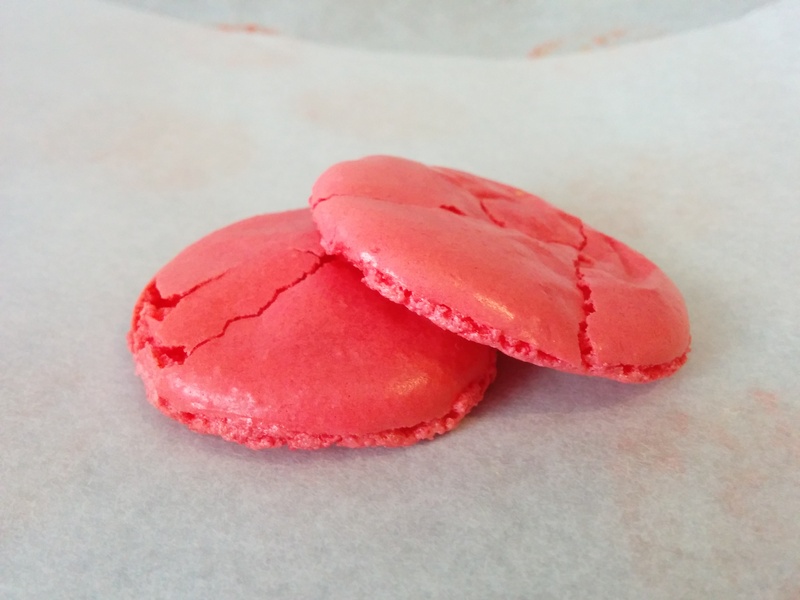 An airy macaron batter is actually quite thick and will hold it’s shape a little too well. When you go to pipe this thick batter, a small peak will be left behind which will not collapse. Therefore, the shell will come out like a spinning top. This batter is far too thick. You can see that that are little peaks on each, which will not settle. This is a sign that your macaronage process was incomplete. To avoid this, the meringue should be mixed with some force. As you fold the meringue into the almond paste (using a spatula), press the mixture down on the sides of the bowl. This will deflate some of the air. Keep doing this until you batter is smoother. Some people say to achieve a batter that resembles ‘magma’, but the last time I checked, most of us aren’t living next to active volcanoes with a safe, yet generous supply of lava. So I’ll share some practical advice with you instead that only involves a teaspoon. Take a teaspoon of the batter and put it on a plate. Initially, you will get a heap of batter with a tiny peak at the top. If this peak collapses within about 10 seconds, the macaronage process is complete and the batter is ready. If the peak is still present, then keep working the batter. When Kevin Bacon told us to get “Footloose”, this is not what he had in mind. Macaron shells that are flat, cracked and have no feet are an unfortunate sight and don’t even have the redemption of tasting delicious. They’re ugly inside and outside. However, assuming that you have made the batter correctly, it is easy to fix. Footless shell. While the shells have a smooth surface, they’re also very flat and very cracked. Feet form due to expansion of air during baking. 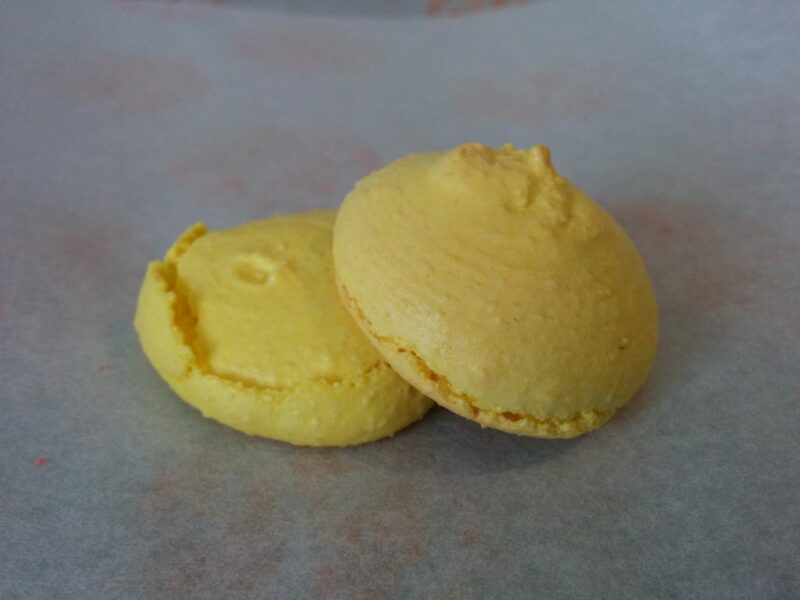 When the macaron batter is placed in the oven, the mixture heats and the air inside expands. As the air expands, the macaron rises, and feet begin to form. 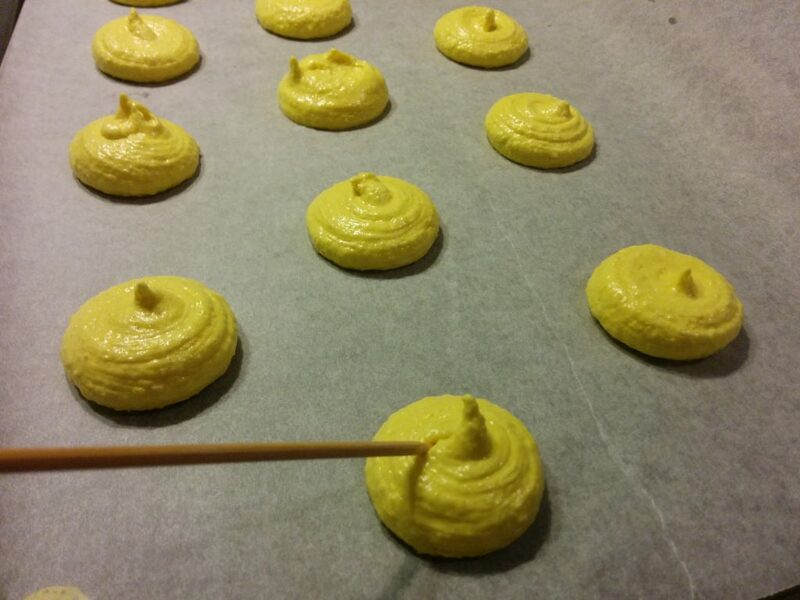 This process is interrupted if the air escapes, which occurs if the macarons have not been properly rested. Resting allows the external surface of the macaron to dry out, forming a “skin”. This skin traps the air during baking, allowing your macaron to rise. Flat and cracked mistakarons occur as the skin has not formed. During baking, the air escapes from the top, cracking the surface, resulting in flat pancakerons. Once your macarons have been piped, a resting time of 1 – 1.5 hours is usually adequate for skin formation. 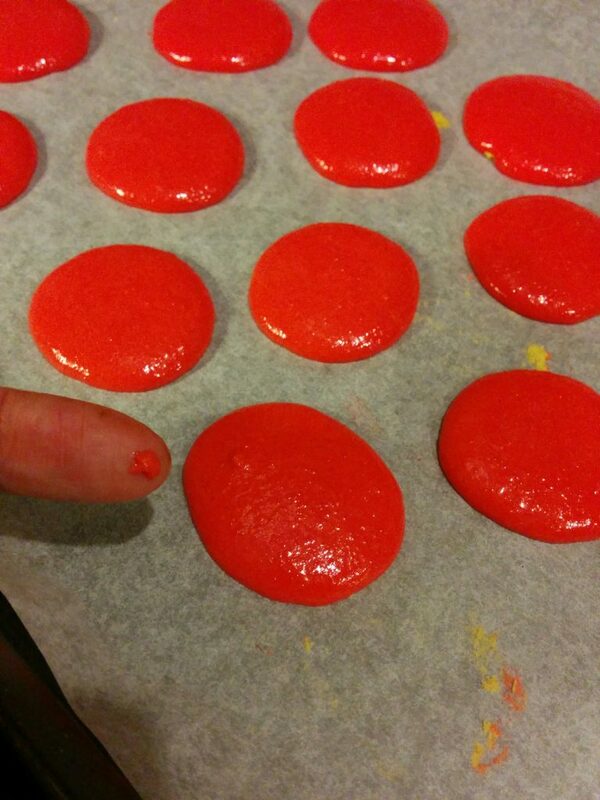 To check that your macarons have formed a skin, gently place your finger on the batter. If no batter sticks to your finger, it is ready. Baking time is incredibly important. You need to give enough time for your macarons to rise and form feet. You also need to allow time for those feet to set, without burning your macarons. Somehow, in my infinite prowess as a cook, I managed to achieved both flat AND burnt macarons. To achieve this miracle, I put rested shells in the oven and excitedly watched as feet started to form, but as I took them out, the feet began to collapse almost immediately. So I popped them back in. However, instead of reformed feet, I was left with a burnt shell. This little misadventure demonstrates the importances of baking time. The recipe I used called for 12 minutes at 150°C. However, my feet didn’t quite set in this time frame. So 1 or 2 minutes longer would’ve been better. Any longer, and the macaron will start to burn. I recommend doing a practise run in your oven. Test a small batch first and check how long it may take. Remember, every oven is different and temperatures can vary drastically between models. If all else fails: blitz! Despite my tips on avoiding mistakarons, you may still be left with turmoil on a plate. Alas, making macarons takes a lot of skill. But even if your shells are cracked or flat, you can still use them in inventive, if not slightly scandalous, ways. With your cracked or flat macaron shells, place them in a food processor and blitz into a fine or coarse powder. This sounds sacrilegious but this macaron dust makes an excellent addition to a range of desserts. If you are going down this way, bake your macaron shells for a little longer in the oven, so they’re not too gooey. It’s quite impressive when you tell your friends that you have used macaron dust in a dessert. It makes your mistakaron feel 1000% more luxurious. So whether you’ve made macarons or mistakarons, you will be a winner! Happy baking! If you have any other macaron tips or stories, share them in the comments. And if you have any other ways to use macaron dust, I’d love to hear it too! I leave you now with some chocolate macarons that I made. I’m on my sixth batch and still can’t seem to get it right! My batter seems almost fluffy once I pipe them, so my final guess is that I’m not getting enough air out during macronage. Thanks for your tips, I can’t wait to try again! Hey Rebecca. Thanks for the comment! It does sound like perhaps the batter is still a little too thick. If you’re unsure if you have the correct consistency of the batter, do a few teaspoon tests before you put it in the piping bag. Good luck in your next baking adventure! Just did my 6th test batch of macarons today and i thought i was gonna get it right this time, but ended up with hollow shells again ans cracked top. Ive watched lots of videos on macronage and it’s really confusing what’s the real true way of doing it. Some dont press the batter on the side of the bowl, some do it like flattening the batter really hard taking the air out. What should it be really? It’s really frustrating. 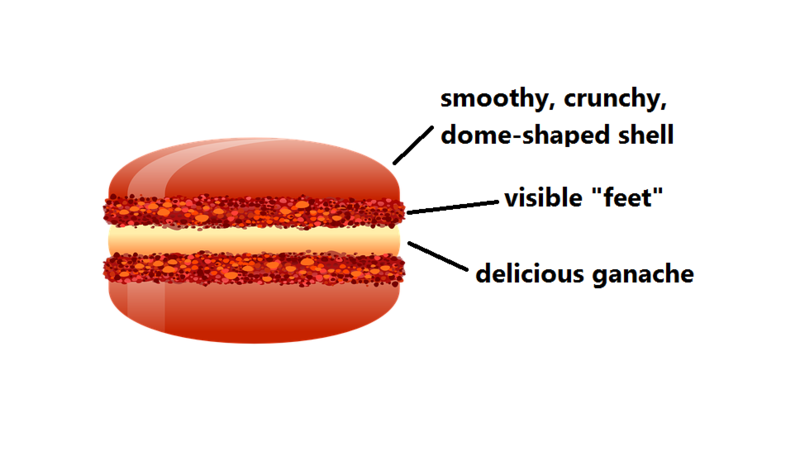 I managed to make one before but without feet but at least they’re not hollow. I forgot what i did though.. i need help! Good luck! I hope you’ll try this again. Its incredibly satisfying when it does work! I have done 3 batches so far and be doing another tomorrow. I have been doing a lot of research on every aspect of the macaron making process. I also saw where a good way to test your batter was to do a figure 8 test. If you can make a figure 8 with the batter pouring off your spatula without breaking then it’s ready. Thank you for your help. I am a very passionate home cook for 4 children…I believe making my first macarons has been so far the biggest failure… I let my badge sit for an hour…weather is cold in Portugal and no crust was formed on top.. I still placed them in the oven and the came out flat and chewie … not sure what to do with my delicious cream cheese frosting and coconut condensed milk frostings….. help..they were soft as marshmallows … and flat..
Hey Carolina. Sorry to hear about your experience, they can be tricky! If the weather is a problem, try using a low-speed electric fan to help dry the macarons. I have not tried this myself, but I’ve seen this technique used to in other recipes to help quicken the drying process. Good luck! Hi …. i did Macarons few times and it turn up well and sometimes it fails. I have problem in drying the Macarons. My country is quite hot and humid. How long do i have to wait for to form skin ?? Hey Niz. Humidity can be a huge problem! 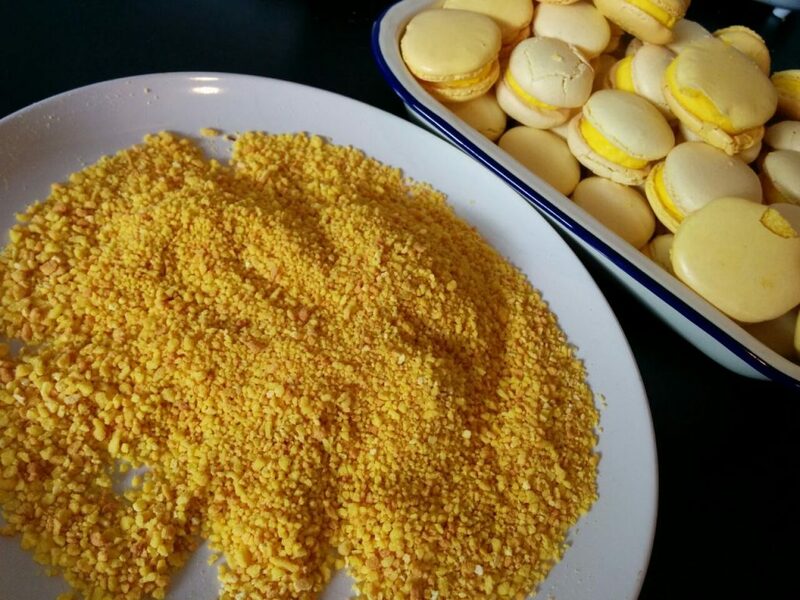 You could try using a low-speed electric fan to help dry the macarons. I have not tried this myself, but I’ve seen this technique used to in other recipes to help quicken the drying process. Good luck! Finally, a macaron-trouble-shooting forum that is still active (because the blogger is not yet so exhausted from all the questions they have stopped reading and replying). And the teaspoon test is a real gem. I have several Qs but will try to keep this novella short … all measurements were done using a scale, egg whites were 5-day aged and brought to room temp., already “super fine” almond meal & powdered sugar were combined and pulsed in food processor and then sifted twice, piped on macaron templates, skin most definitely formed on the mac “disks,” oven temps corresponded to oven-temp testers, trays banged … you name the tip and I’m pretty sure I did it. BUT … first off (and I used the Italian method, dripping 118C sugar syrup into semi-whipped egg whites), my almond/confection mixture, into which stiff meringue peaks were folded, resembled liquid cement imminently about to harden (even after folding and folding and folding and folding) — so I added a little extra aged egg white I had left over. Maybe that did me in? Second, the recipe (from Jemma Cupcake, I believe) advised to add gel food coloring to the almond/egg white mixture, not to the whipped meringue, which instruction I dutifully followed. Combining gel coloring into ready-mix cement was no easy feat. After all the folding and egg-white augmentation, I did get the “ribbon” consistency in the batter. Third, my ready-mix cement, after coloring, looked like mint chocolate chip/pistachio ice cream. For the duration of the ordeal, the macron batter maintained this pistachio/mint chocolate appearance. Results: Delighted to report I nailed the food coloring — the colors of the batter and butter-cream filling turned out beautifully, and I now have a green thumb (hopefully glue-gone will remedy the thumb). As for the macarons, after 3 trays (each baked separately), I put the remaining batter, of which there was MUCH, in pastry bags (inside air-tight mason jars), shoved them into the fridge, and then fell prostrate on the kitchen floor. The “macarons” came out “domed” (as in the top half of a broken egg shell), they cracked like old asphalt, and many of them stuck to my silpats. The domed, half-an-egg shell appeared within 5 minutes of being in the oven; the cracks came shortly thereafter. Feet? Forget it. Not even one big toe. Any ideas where I went wrong, other than at every turn? For every problem I encountered, some chef bloggers have answered older queries from other readers with: the almond mixture was over-mixed or under-mixed, or the egg whites were over-beaten or under-beaten, blah blah blah. Consistent solutions for asphalt-cracked, domed egg-heads (which never collapsed) continue to elude me. Would that I could, but I cannot blame my stand-mixer — a new Breville, which — and I’d be selfish not to share this with everyone — is like having a Bentley in the kitchen. I have two things on my bucket list I’m determined to accomplish: mastering smoked brisket and macarons. Thank you kindly in advance for any suggestions you are willing to give. Hey Know Dough. Making macarons can definitely be vexing but can I confess, I have never used aged egg whites and never sift my almond meal or icing sugar! While these things can help to create a superior macaron, its not essential. So we can exclude those variables as the main cause of your cracking problem. 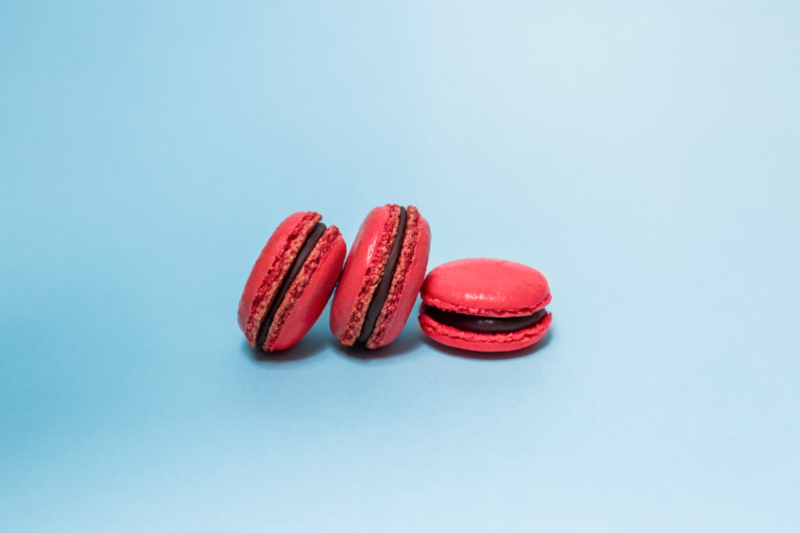 Almost all of the time, cracked macarons are a result of the skin not forming. The piped macaron discs need to be exceptionally dry before placing them in the oven. Even a little moisture is enough to cause a crack. I once waited 2 hours for my discs to dry, mainly because it was so humid in my house at the time. The other time Ive experienced cracked macarons is when I piped the discs too close together, but again, this affects the drying. Give your macarons ample space between them. This will allow them to dry evenly and bake evenly. Some people say that cracking is due to the batter being an incorrect consistency but I have generally found this not to be the case. Even a thick batter, if properly dried, can form feet in the oven. And a very thin batter has virtually no air in the mixture, so doesnt have enough air to even form a crack in the first place. I hope those thoughts help, good luck! Thank you for your quickly response. I mentioned sifting because the almond meal was markedly visible in the batter and remained so. As far as the skin goes, I waited well over an hour (in very low humidity kitchen), busying myself with making the filling. The skin was quite dry — I was almost afraid I’d waited too long to put them in the oven. Maybe spacing was my problem — I didn’t offset the rows. Thanks for your suggestions. I’m going to try again, using the French method vs. the sugar syrup/Italian one. My meringue peaks were extremely stiff — peaks didn’t flop at all. Hey Kate. Sorry to hear of your experience. If theyre too cookie-like, they may be over-baked. Play around with your oven times and you should find a texture that you like. In terms of chewiness, thats probably to do with the texture of the batter. Work the batter more, and that should reduce the chewiness. In terms of recipes, almost all basic macaron recipes are the same, containing the same ingredients in the same ratios. I think that its always good to start with a basic vanilla, so you can nail the shell before adding things like food colouring or other flavours. Good luck! Hello. I just made my first batch and seemed to have great success…until biting into them. Anyhoo. I haven’t seen this specific issue listed nor a way to fix it. Any ideas? Overall I’d say my first attempt was quite successful but still needs a little tweaking. Hey Jessica. Great to hear! I have had this giant air hole happen to me a few times. I’m not 100% why but its probably due to a large residual air bubble in the batter, that expands too much when baked. Most recipes say that these bubbles can be burst by tapping the baking tray onto the table, before baking. Maybe that will work? Cheers!